Utilitech has an inexpensive sensor for Iris by Lowe's and other Z-Wave hubs, but it's a hassle to set up. Of all the flood sensors available to Iris by Lowe’s users, Utilitech’s Water Leak Detector is the cheapest. It’s also the least flexible. 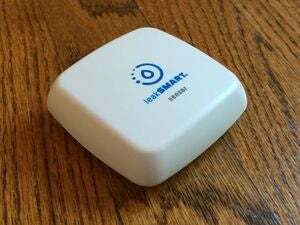 At $30 apiece, you could place a lot of these sensors around the house without breaking the bank, but each one is bothersome to set up and has limited battery life. Also, Lowe’s requires a premium subscription for integrations that are free with competing products. The Utilitech Water Leak Detector is the only product we’ve tested whose sensor must stick to a wall. After mounting the transmitter, you must run the attached cable down the wall using a set of included anchors, and then attach the sensor section so that it’s pointing toward the floor. 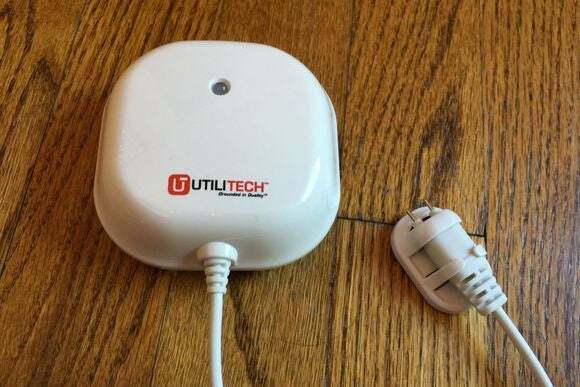 Aside from being a pain to set up, Utilitech’s sensor doesn’t allow for certain practical uses, such as snaking the sensor underneath a washing machine, or placing it away from the wall. At least the software setup is painless. Inserting three AA batteries and pressing the button next to them sets the sensor to pairing mode, and it’s quickly detected by the Iris by Lowe's app. The Utilitech Water Leak Detector may work with other Z-Wave hubs, albeit imperfectly. 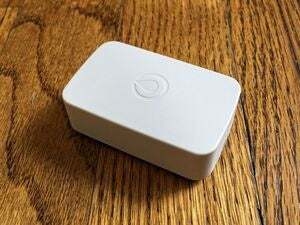 Samsung’s SmartThings hub, for instance, recognized the sensor as an “EverSpring” device, but your mileage may vary as Utilitech only advertises the device as working with the Lowe’s system. On the downside, the Iris system gets expensive in a hurry if you want to integrate the sensor with other devices, such as water shutoff valves and smart lighting. Lowe’s charges $10 per month for these automations, which are free with other platforms such as Wink and SmartThings. One other issue: While we haven’t tested long-term battery life, Utilitech claims that the three AA batteries require replacement after just one year, and the app doesn’t provide a battery level. Other battery-powered sensors tend to last at least a couple of years. Between Utilitech’s low price and Iris’s strong alert capabilities, this sensor could be good enough. But it could also be a non-starter if you’re looking for a particular placement without a wall nearby. The Utilitech water leak detector is very inexpensive and can be incorporated into any Z-Wave smart-home hub. But its own siren is too quiet to be of any use, and it must be mounted to a vertical surface.